As you have probably gathered, I really enjoy astronomy. I like looking at objects in deep space, gazing at the moon and the planets of our solar system, and sometimes even enjoying a glimpse of a comet. I enjoy using my telescope but often, at my home in New England, the skies are overcast, or the weather is rotten. (Especially this current winter with record amounts of snow fall.) So what does one do to enjoy a little astronomy when the sky doesn’t cooperate? Find an alternative, I say. This is easy for Starry Night users, who can look at the LiveSky menu and select ‘Online Telescope Imaging…’ which opens a browser window to access a site called SLOOH. Several years ago, I learned about www.slooh.com. The name SLOOH is a play on the word slew, which in Astronomy circles to slew a telescope is to move it’s position. 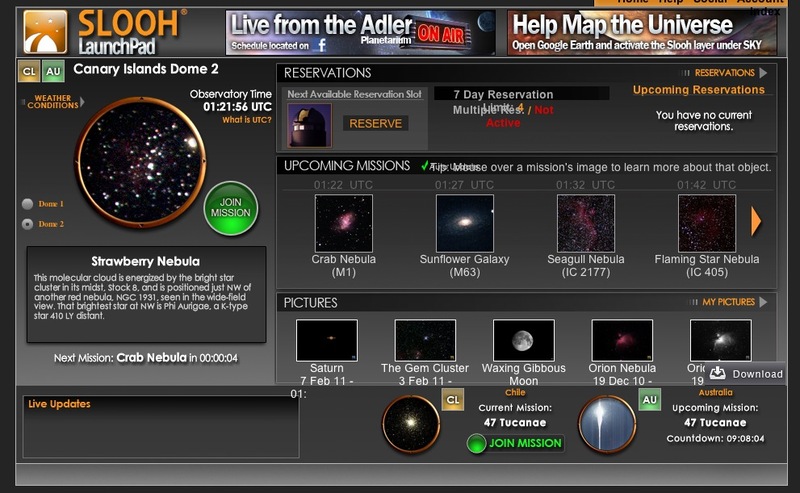 What slooh.com offers is access to large 20” telescopes, via the Internet. The telescope is controlled remotely and moved through a series of targets as the night moves on. The scope stays with each object for a period of time, giving the camera time to collect and even color the light, producing beautiful images. 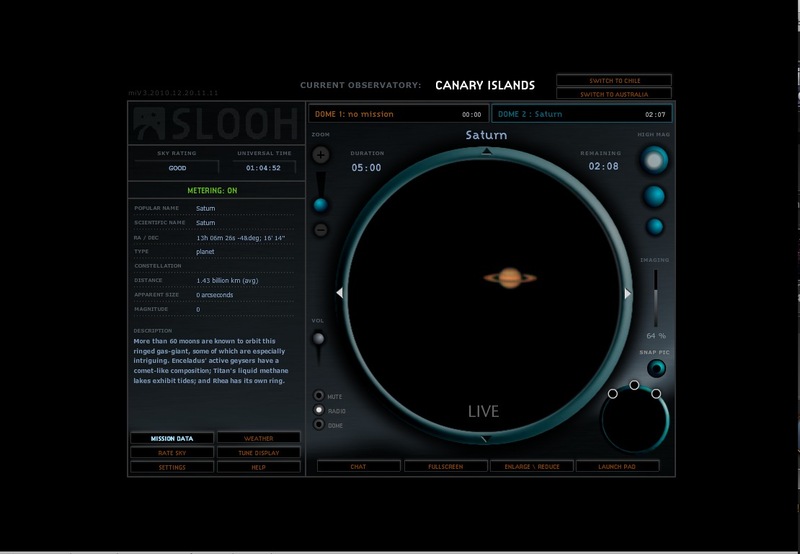 The SLOOH interface is the user’s window to what the telescope sees. You can watch as the image develops on your screen. Starting with a monochrome, then watch the colors revealed as various filters are applied. You can capture up to three images any time during the exposure, you select when. One of my favorite tricks is to make an image before the colors start, and one just before the end of the exposure. This gives a great comparison of naked eye viewing versus a time exposure. 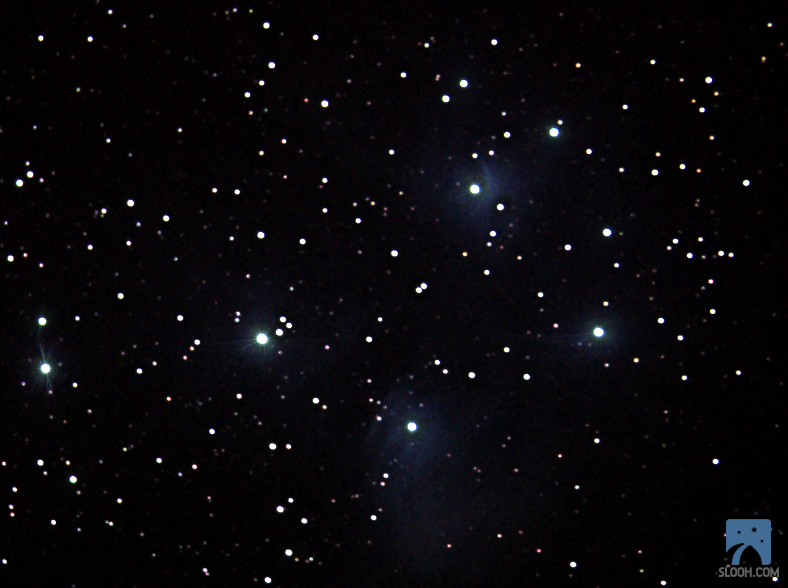 Granted, you are not specifically in control of where the telescope points, or how long the exposures are, but a great many of the objects available to see based on the time of year are on the list. Also, don’t forget, two very important aspects of this telescope: It is large (20” reflector) and the position of the telescope. When SLOOH started, there was one telescope on a mountain in the Canary Islands, which is close to the equator. This means that it can “see” most of the sky, north and south. 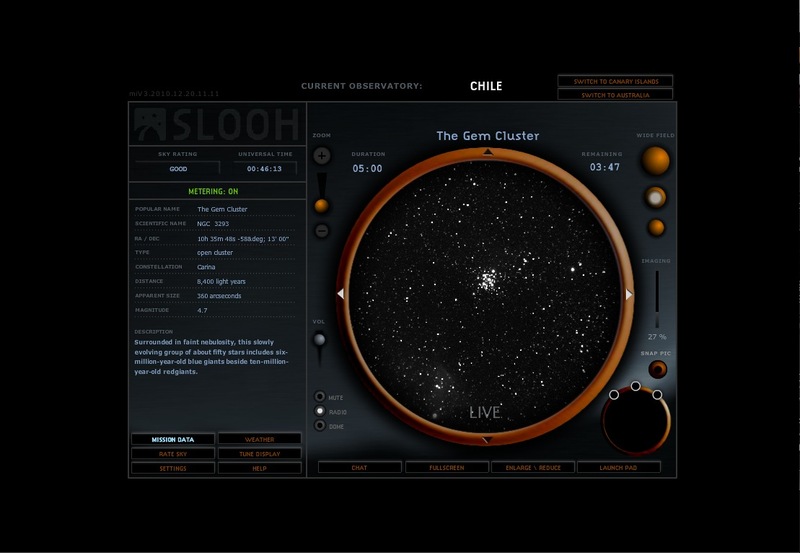 Within the past year, SLOOH has added two more telescopes, one in the mountains of Chili and one in Australia. (They recently shutdown the Australia site because the weather conditions there we rarely good and they weren’t getting much use of the telescope.) With telescopes in these various locations, a member has the potential of being able to see any part of the sky. After you log into your SLOOH account, you are then taken to the “Launch Pad” which gives you access to various features of the site. In addition to the three telescopes, there is a link to the images you have downloaded, banners telling you of “radio shows” the site provides, access to reservation of time slots, as well as a brief list of what is currently being looked at as well as what the next few targets are. From the launch pad, you can choose which telescope you would like to see, providing that telescope if currently on line. Once you choose a telescope, a new window opens which is your window to accessing the telescope view and information about what is on the screen. This window provides your view of what the telescope is seeing as well as a lot of other information. Take a look at my screen shot. First of all there is a big circular area which displays what the telescope camera is seeing. As the exposure continues, you watch see it change in this window. A button near the bottom of this circular area shifts the camera view into full screen. To the right of the circular view area there are three buttons that control the view you see. There are three possibilities, High Mag, which gives a view using the maximum magnification, Wide field shows the image in a wider field and with less magnification. (Note that some objects do not use the high magnification, because it wouldn’t make any sense. Looking at a small corner of a large object wouldn’t be of much use). The last view is “all sky”, which is essentially what you would see if you just looked out of the telescopes dome. The left hand side of the window is the information area. There are several choices of information and settings to choose from. 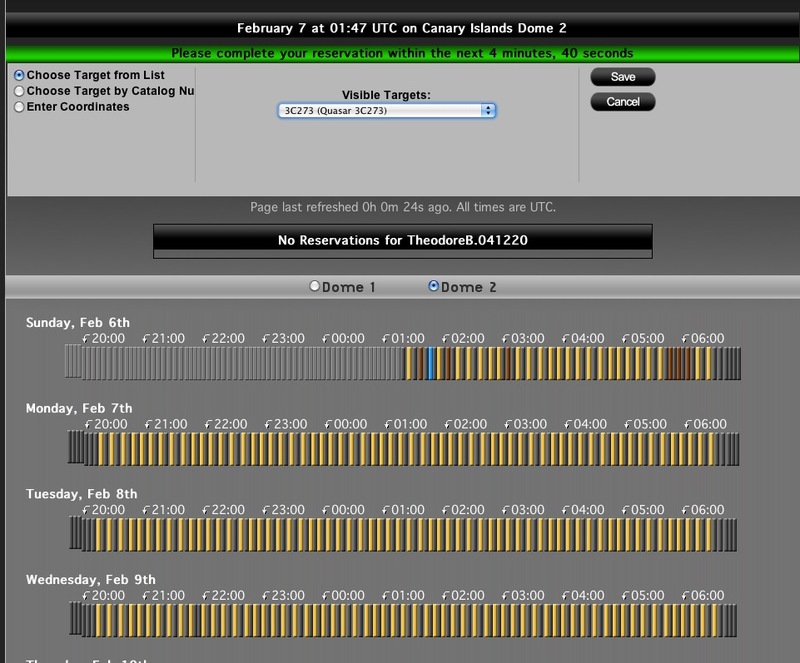 The default is “Mission data”, which offers information about the object currently being viewed. The other tabs provide other features, for instance, you can tune the program to your system and display, check the weather conditions at the dome, or get some help. When there is a radio event on there is usually a chat channel open for members to ask questions/make comments during the show. You can digitally enlarge an image, see how long the current exposure is and how much time is remaining, and more. SLOOH has a presence on Facebook, Twitter, and interacts with Google Earth. There is also a forum to participate in if you like that. With Google earth, you can share your images of the universe with the Google earth (universe view) site. It’s a cool way to share your work! One feature, I haven’t tried personally, is the ability to schedule a time slot to view coordinates that you are interested in. There are three options for selecting a target, choose from a list of objects, choose by using a catalog number, or enter the coordinates of an object or area of space you are interested in. The schedule window shows slots for the current week. So to schedule the telescope you choose an object and an available time slot. Just be sure that you will be able to view the scope when your time arrives! Otherwise, you will miss the view. 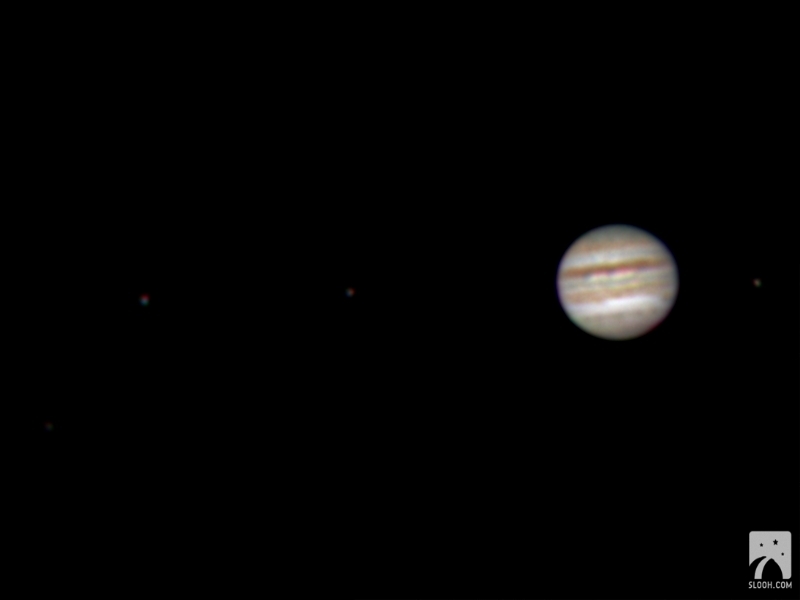 While looking at a live computer image of what the telescope can see isn’t as exciting as looking through one’s own telescope in the backyard, it is very nice. The images that you capture are tagged and dated, then stored for your later perusal or downloading. 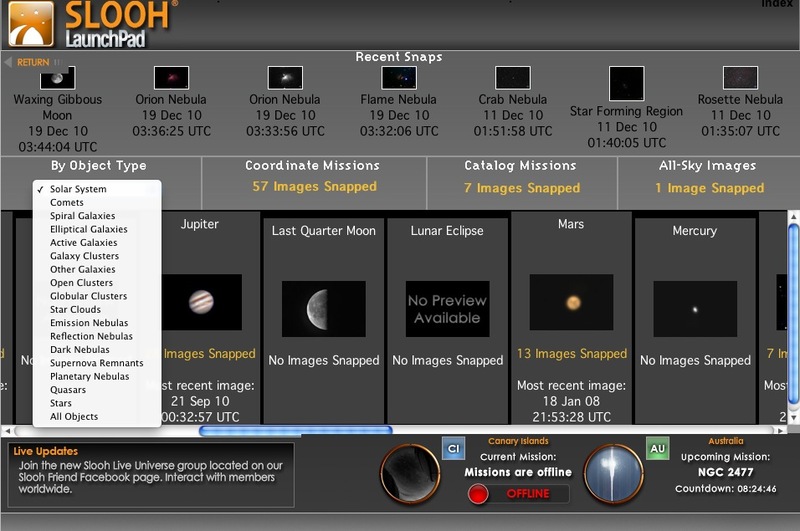 The SLOOH site organizes the images you have captured for easy retrieval. 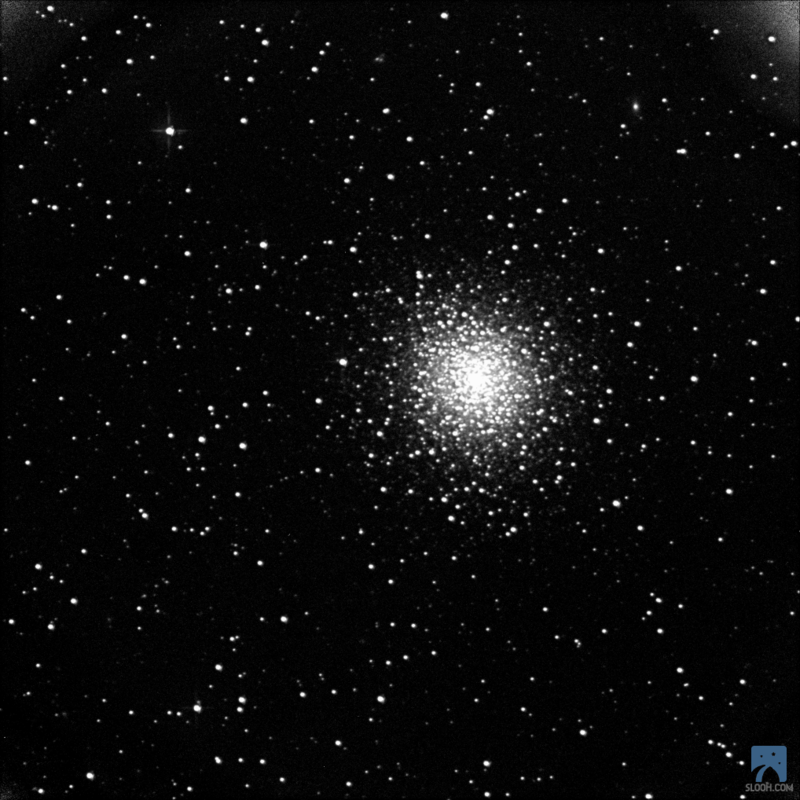 The images are organized by category such as Solar System, Globular Clusters, various types of galaxies, and more. When you select a type, you are presented with a list of objects of that type, each object in the list also indicates how many images of that object you have collected. It also tells you the time and date of the most recent image. If you click on a specific object, you are shown a list of your images. Here you can enjoy looking at your images or download them for better processing. 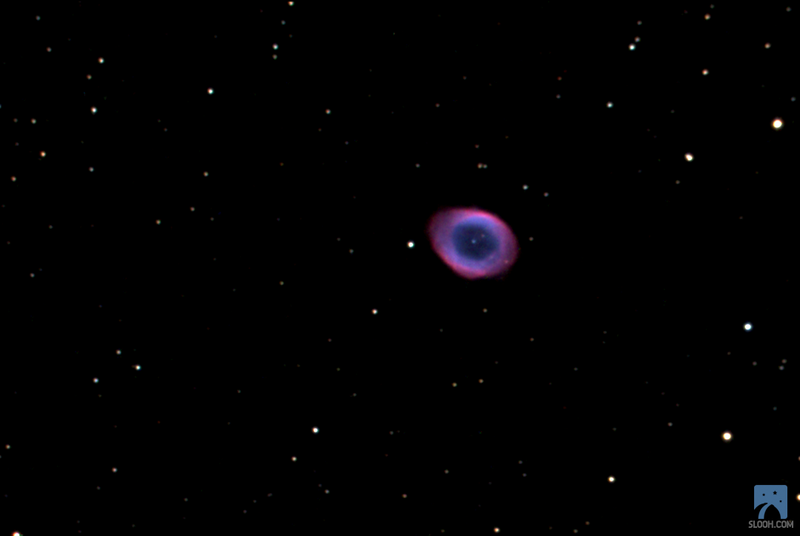 As with any astrophotography image, a little digital darkroom works can go a long way! You can also delete images you don’t like. Besides downloading the image, you can share the image with your friends. SLOOH provides easy links to many different social networking sites. Images have a SLOOH logo on them, so they get credit for the image, but they are your images to work with. Being a Mac guy, I collect and process my favorite images and have made a photo slide show of them. Mostly I use my favorites for backgrounds on my desktop and as a screen saver. There are two basic plans for buying into SLOOH. First there is the “Commander Membership”. With this membership you pay an annual fee and can log in and view any of the scopes any time they are up and running. You also have a fair amount of personal scheduling time (When I started years ago the membership included so many minutes of scheduling time, currently it appears that, as long as things aren’t busy, you can use more time. The Commander fee is $50 a year, but I noticed that Amazon.com sells it for a discount. The other method is called a Credit Membership. In this plan you buy an amount of credits which can be used anytime you log in. When you use them up, you can buy more credits. You can buy credits along with activity books and other things from various retailers. SLOOH links directly to Amazon.com as their retailer, but I have seen the packages at other locations. I have been a member of SLOOH for several years. My activity varies, but when I have a bit of free time I like to log in and see what’s on the display. As with any telescope, weather conditions can be an issue. Cloudy skies, a full moon, and other factors can make the telescope unavailable. Sometimes the images are spectacular and at other times they are terrible. But this is typical for astrophotography. The radio shows have come and gone over the years I have been a member. It’s great listening to an astronomer (amateur or professional), as they share their insights and thoughts about astronomy. I truly enjoy this site and the services they provide. I intend to remain a member as long as I am able. I really enjoy this site and have a great time watching the sky through their telescopes. If you want my advice, I’d encourage you to visit SLOOH’s site and see what they have to offer.